Terraforce > News > Details > - Installation Guidelines > 5/2018 – Reputable installer key to a good looking retaining wall! 5/2018 – Reputable installer key to a good looking retaining wall! 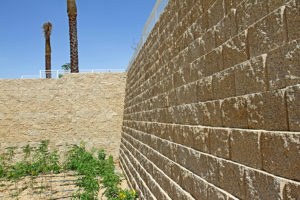 At Terraforce, we cannot stress enough the importance of a correctly installed Terraforce retaining wall: an improperly built retaining wall may bulge, crack or lean, creating an eyesore and a headache for you. 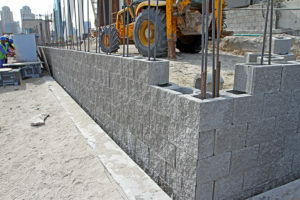 That is why, for larger and more complex walls, we recommend using an experienced retaining wall installer, someone who is familiar with Terraforce blocks. 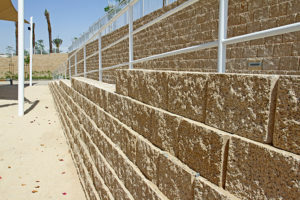 Because no matter how great the design and planning, execution is just as important in producing a long lasting and attractive retaining wall. 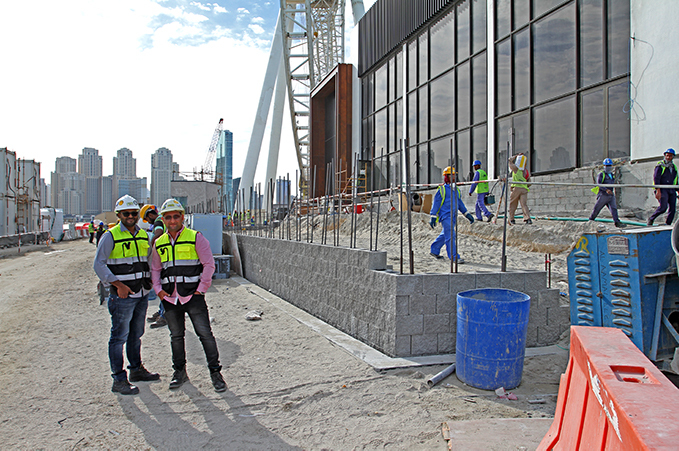 After recently visiting Dubai and conducting a series of site visits, we can highly recommend Sinan Awad, Al Aamal Construction as recommended Terraforce installer. Below we showcase two recent projects by Al Aamal Construction that impressed us with their impeccable finishes. 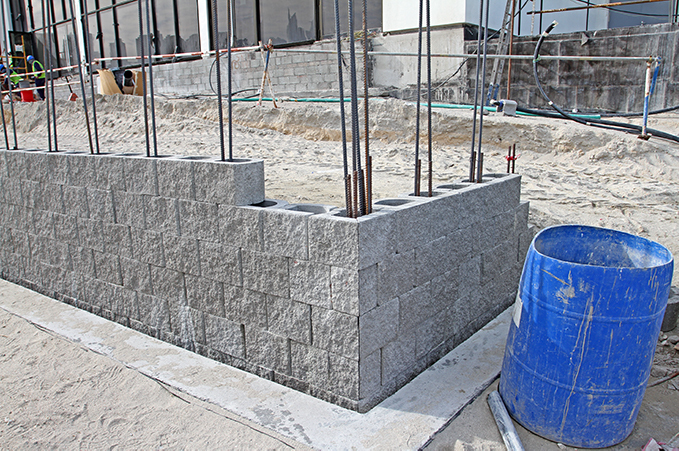 These retaining walls, at the Blue Waters Island conference facility, were needed to solve differences in building levels and consist of a series of Terraforce L16 rock face block walls with several sharp corners. 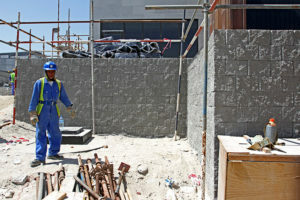 Initially the client, Meraas, a Dubai-based holding company, was hesitant about how the blocks would work, but after seeing the first walls installed, became very happy with the versatility of the system, and how it solved many problems for them on site. 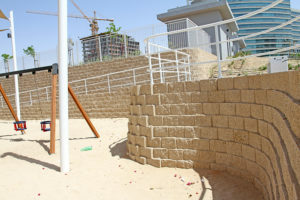 In total 5300 Terraforce L16 blocks, manufactured by Consent LLC, were installed to date, with soft landscaping to be implemented at a later stage. 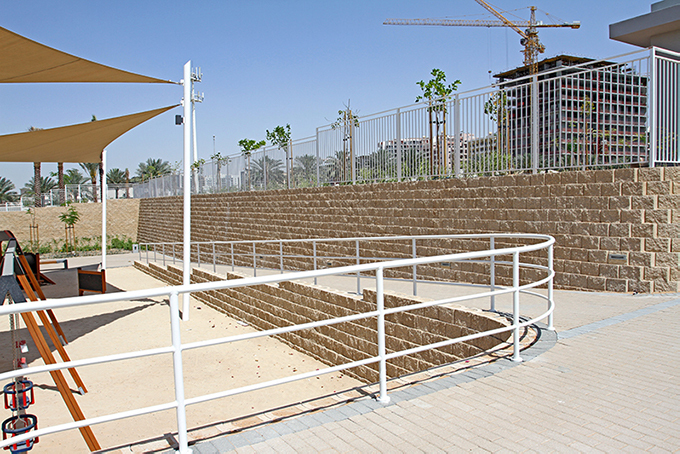 The client has requested more Terraforce walls at other areas on site, based on the quality of the installation by Al Aamal Construction. 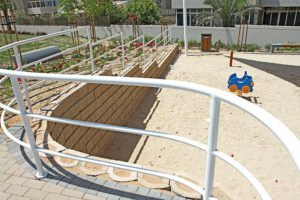 The blocks were specified by Proscape, who had used the product at DSO previously. 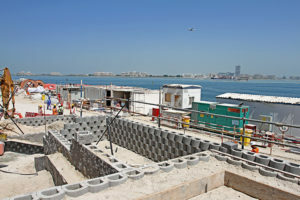 Says Awad: “We used precast foundations, 600 mm wide and 150 mm deep. 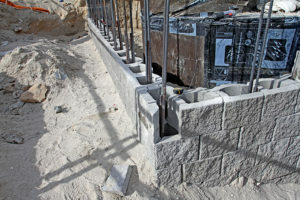 For the vertical walls we placed steel rebar every 900 mm and concrete filled the blocks, as well as horizontal steel bars – by cutting grooves into the blocks – in the second last row for extra stability.